Recipe courtesy of Charmian Christie (www.themessybaker.com). East meets West in this no-fuss take on an Indian classic. 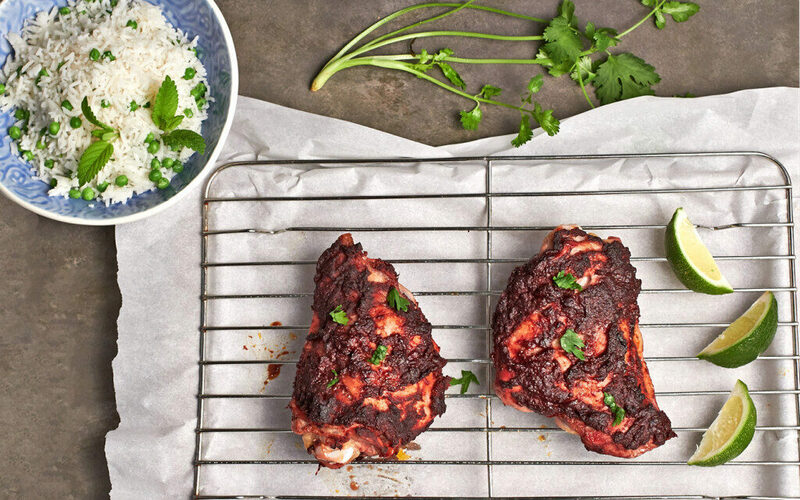 Deep red tandoori paste infuses turkey thighs with colour and spice, while the cucumber-based raita cools things down. Lime and mint add a burst of contrasting colour and brighten the flavour. With so much flavour and colour, it’s hard to believe this is barely more than a bake-and-serve recipe. Place the turkey thighs in a glass baking dish. Score the skin side deeply a few times with a sharp knife. Flip the thigh over, and score the underside. In a small bowl, combine the tandoori paste, garlic, lime juice, and oil. Mix well to combine. Spread the paste on the underside of each turkey thigh making sure it is worked into the score marks. Flip the thigh over so it’s skin-side up. Spread with the remaining paste, again ensuring the paste is worked into the score marks. Cover with plastic wrap and refrigerate 8 to 24 hours. Preheat oven to 350°F (175°C). 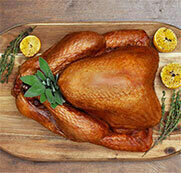 Transfer turkey thighs to a new baking dish or a rimmed baking sheet lined with parchment. Discard excess marinade. Bake 60 to 75 minutes or until the internal temperature reaches 165°F (74°C). Make sure the meat thermometer is inserted into the thickest part of the thigh without hitting the bone (since this will give you a false reading). Serve hot with extra wedges of lime, a sprinkling of fresh cilantro and lime-mint raita. Using the large holes of a box grater, grate the cucumber. Squeeze out excess moisture with your hands. Place in a small bowl. Add the yogurt, mint, lime zest, lime juice, salt and pepper. Stir until well combined. Serve immediately. This can be made ahead and refrigerated while the turkey marinates.